To be eligible, a veteran must have served in the U.S. military for at least 90 days with an honorable discharge. The applicant must be totally disabled or at least 62 years old with at least a 10% disability. The assessed value of the taxpayer's Indiana property -- real property, mobile home not assessed as real property, or manufactured home not assessed as real property -- cannot exceed $175,000. This is a change in the state law that takes effect for the 2017 assessments for taxes payable in 2018. For taxes payable in 2017 and earlier, the AV limit is $143,160. To be eligible, the veteran must have received an honorable discharge after serving in the U.S. military or naval forces during any of its wars. The applicant must have a service-connected disability of at least 10%. This deduction is sometimes referred to as the partially disabled veteran deduction. A veteran's surviving spouse may claim these deductions if the veteran met the eligibility requirements at the time of death and the surviving spouse owns property or is buying property under contract at the time the deduction is filed. 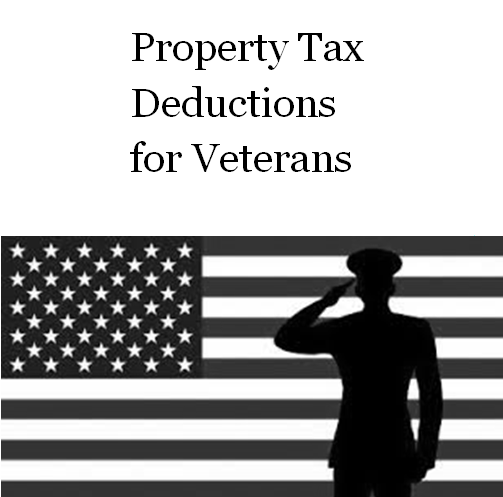 The veterans deductions subtract an amount from a property's assessed value. The Totally Disabled Veteran/Over 62 deduction subtracts up to $12,480. The Service-Connected Disability deduction is a maximum of $24,960. The deductions can be applied to real property and to mobile/manufactured homes not assessed as real property. How much these deductions can save you on your tax bill depends on factors such as your tax rate and assessed value. Below is an example of taxes payable in 2015 for a homestead assessed at $130,000 in the city of Portage with and without the veterans deductions. After applying the deductions to real property, a veteran may use the balance toward personal property tax and then as a credit toward excise tax. The excise tax credit must be applied for annually at the County Auditor's Office. A veteran must provide proof of a disability when applying. Supporting documentation includes a Pension Certificate or Award of Compensation by the United States Department of Veterans' Affairs or a Certificate of Eligibility issued by the Indiana Department of Veterans' Affairs after the IDVA has determined that the disability qualifies the veteran for the deduction. Veterans may receive both the Totally Disabled/Over 62 deduction and the Service-Connected Disability deduction if they qualify for both. For real property, the application form must be signed and dated by Dec. 31 for the deduction to be applied to the following year's tax bill. You may also want to pick up our flier, "Property Tax Deductions for Veterans," which has more details. The flier is available at the County Auditor's Office. Important Note: The information on this page is intended to be used as a general guide only and does not constitute legal advice or a final determination of one's eligibility for a deduction. Other restrictions may apply.